Now available from Barrier Security Products , Centurian C90SM fixed surface mount bollards are designed for traffic control, and property and asset protection applications. 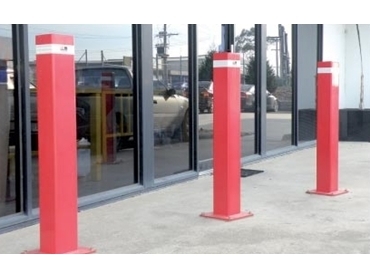 These surface mount bollards are designed for medium duty applications. Manufactured from heavy wall mild steel tube with fully welded base plates, hard knocks are no problem for these surface mount bollards. Centurian C90SM fixed surface mount bollards are available in both round and square designs and are supplied complete with the necessary fixings for installation into any concrete surface. These surface mount bollards are 90mm in diameter and 900mm high, with a 5mm wall thickness and a 6mm thick base flange with four mounting holes. They weigh approximately 9kgs and are available in a hot dip galvanised finish or hot dip galvanised with powder coat finish.